American is in fierce competition with Delta, JetBlue and United to become the reigning lie-flat champion between New York and San Francisco/Los Angeles — so we asked TPG Contributor Kevin Song, an AAdvantage Executive Platinum elite, to take a closer look at the carrier’s Airbus A321T, the only aircraft to offer a three-class configuration on these domestic transcon routes. Earlier this year, I flew on American’s A321T from Los Angeles (LAX)-New York-JFK, bumping myself from business to first with a systemwide upgrade. Having already flown economy and business on this route, this flight was my chance to check out American’s transcon first — and I even had a brief stint flying way up front. As boarding commenced on board the A321T from LAX-JFK, I was graciously invited to try out the one seat I hadn’t yet experienced on this aircraft: the captain’s seat! Average one-way prices for transcon routes aboard American’s A321T are about $1,900 in first class, $1,600 in business and $240 in economy. Since the routes span about 2,500 miles’ worth of the continental United States, though, they make for a great mileage redemption value. 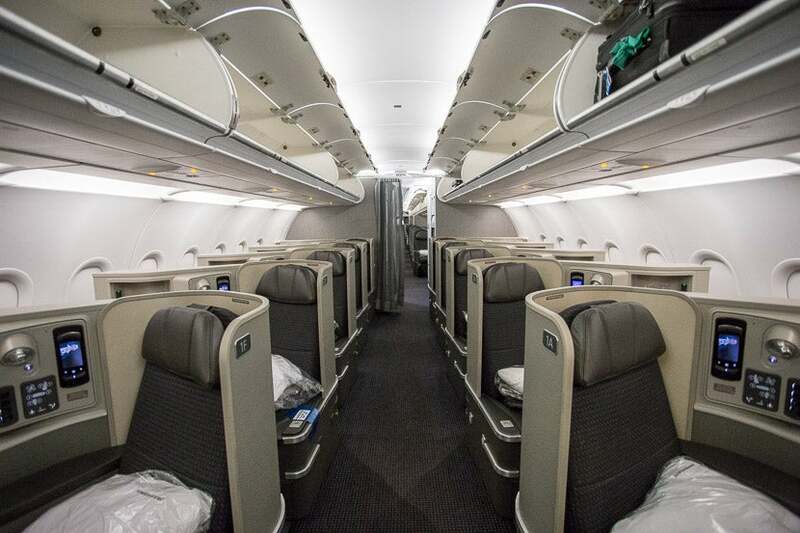 SAAver level award seats on the A321T can be difficult to find, but if you’re lucky, you can redeem for 12,500 AAdvantage miles each way in economy, 25,000 each way in business or 32,500 each way in first class (these amounts will increase on March 22, 2016). 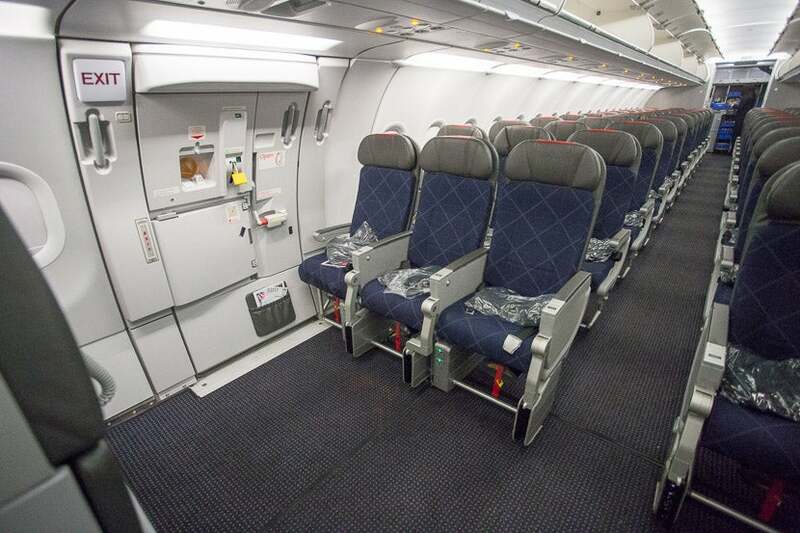 American’s A321T features a three-cabin configuration, including this first-class cabin. 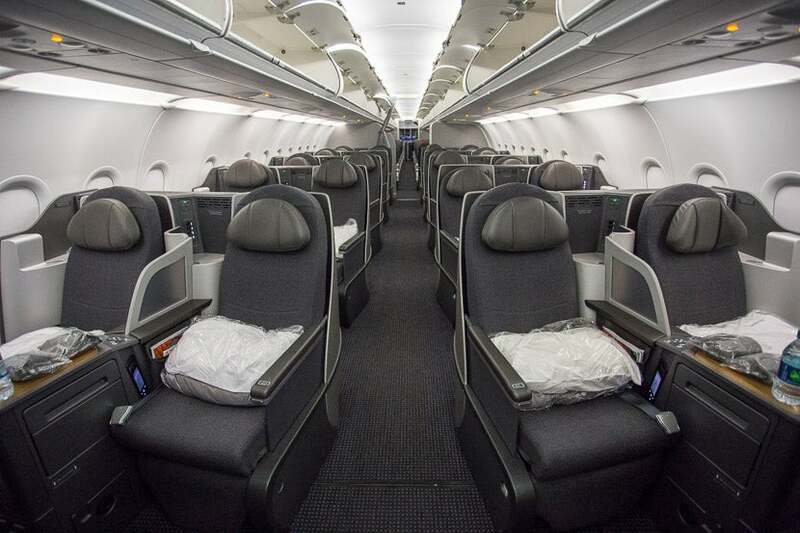 First class aboard the A321T has 10 lie-flat seats in a 1-1 configuration of five rows. Each seat has 62 inches of pitch and is 21 inches wide, with a bed length of 82.5 inches. Though it’s the only first class you’ll find on a domestic transcon route, it doesn’t afford you all that much unless you 1) want a slightly improved meal service over transcon business and/or 2) really hate sitting next to someone. In fact, if you’re traveling with a companion on this route, I’d highly recommend you opt for business class, as you’ll be able to talk to him or her much more easily. To read more about what it’s like to actually fly first class on the A321T, be sure to see TPG’s review. The only real reason to book first class is if you really need the extra privacy and uninterrupted sleep. 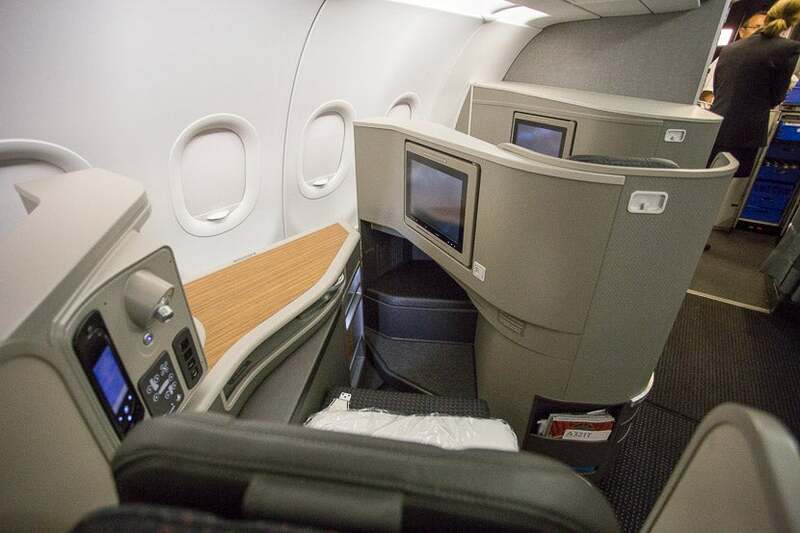 The seat really is above and beyond most domestic products — in fact, the first-class seat here is actually pretty much identical to the well-touted business class seat on American’s internationally configured Boeing 777-300ER (77W). For additional privacy, each first-class seat is angled away from the aisle and toward the windows. The seat features a nice space to keep drinks and other personal items, as well as a large personal entertainment screen. The at-seat space is large enough that you won’t need to move your drinks and personal items each time you want to get up. To the left, there’s a console with a power plug, AV ports, USB connectors and a seat control where you can adjust and recline. The main 15.4-inch personal entertainment screen pops out, so it needs to be stowed during take-off and landing, and a smaller fixed secondary entertainment screen can be used to control your media without reaching toward the touch screen. The seats are high enough to have quite a bit of privacy from people walking past you in the aisle. At the foot of the seat, you’ll find an ottoman, as well as a cubby that’s large enough to store shoes, a small bag, your comforter, etc. I was able to stretch out comfortably, but I’m not particularly tall — taller people might have some issues. Fly your pets in a little more comfort in the A321T’s first-class pet cabin. I flew this route four times over the spring and summer and on each flight, first class was filled with children and families — though this might very well be related to school vacation schedules. 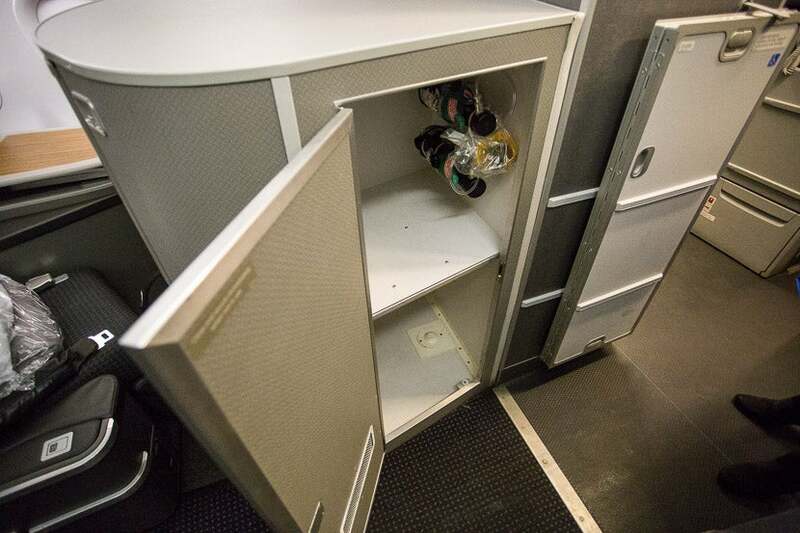 I never did see an animal on board, even though the A321T’s first class includes a “pet cabin.” In reality, this is merely an unpadded closet with an air vent and oxygen mask — more utilitarian than luxurious. The flight attendants on this particular flight weren’t even aware this space was intended for pets until I pointed out the oxygen mask in the compartment. 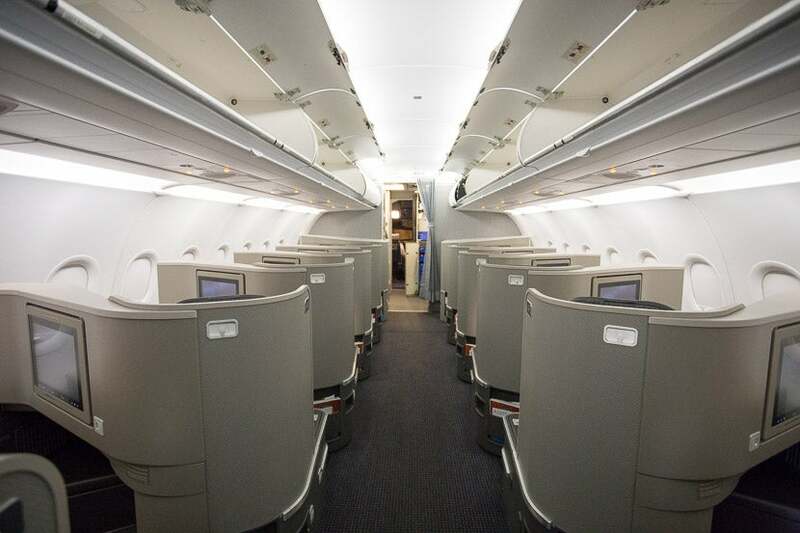 The A321T’s business class has 20 seats in 2-2 configuration of five rows. Each seat has 58 inches of pitch and is about 19 inches wide, with a bed length of between 75 and 78 inches. More comfortable than private, each business-class seat is angled away from the center, so when you’re slightly reclined, you can’t directly see your neighbor. The A321T’s business class offers the same amenity kit, Bose headphones, personal entertainment screen, connectivity ports and power outlets as you’ll find in the A321T’s first class. The business class cabin is really comfy and a wonderful way to cross the country. 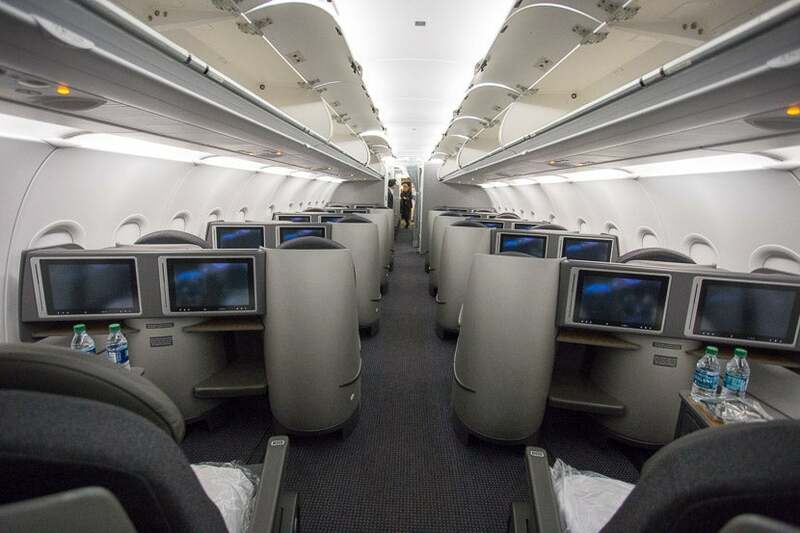 Each business-class seat has its own 15.4-inch fixed-screen personal entertainment system that can be used for the entire flight, including during take-off and touchdown. There isn’t quite as much at-seat space to store personal belongings as you’ll find around the first-class seat, but there’s an area designed to hold your smartphone and a small shelf under the entertainment screen where you can keep something small like a book or digital tablet. You’re seated next to another passenger, but the seat is recessed enough to be able to not have to look directly at the other person. Having now flown both business and first on this aircraft, I feel there’s not much reason to pay for the A321T’s first class. I’d only consider splurging on first if I was dead set on avoiding possible interaction with my fellow passengers for the entire trip. Unlike in first class, passengers in business have pretty much no privacy from people walking past in the aisle. The A321T’s business class certainly offers less privacy than its first class — the walls around the seat aren’t particularly high, so people walking in the aisle can easily see everything you do — but the seat itself is really comfy and has all the bells and whistles I’d look for in first class. 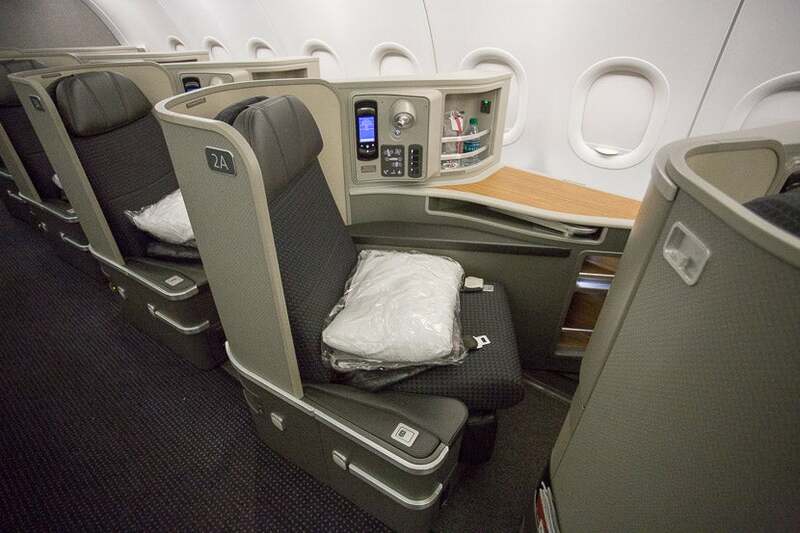 Be sure to check out Eric Rosen’s business class review on the A321T for more details. The A321T’s economy cabin includes 72 new slimline seats — 36 premium-economy Main Cabin Extra and 36 standard-economy Main Cabin. Both types of economy seats are 18 inches wide, but Main Cabin seats have between 31-32 inches of pitch, while Main Cabin Extra offers about five extra inches of legroom. 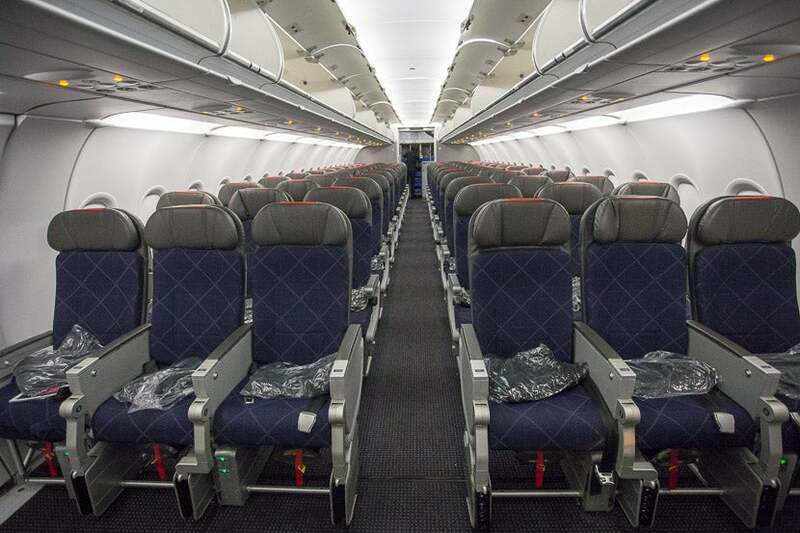 The economy cabin on the A321T is actually pretty short, with only 12 rows. Half of the seats are designated as Main Cabin Extra. 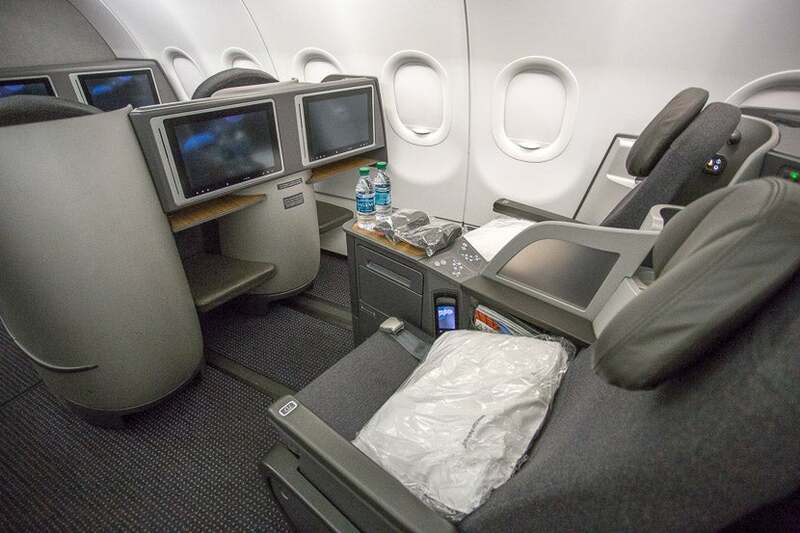 Rather than a separate class of service, Main Cabin Extra is preferred seating that you can either purchase (on transcon flights, we’re talking about $100 additional each way), or receive as an elite benefit. Beyond extra legroom and Group 1 boarding, there are exactly zero service differences between Main Cabin and Main Cabin Extra — but on a nearly six-hour flight, those five inches of extra legroom can be really beneficial. To see what it’s like to fly in these Main Cabin Extra seats, be sure to see my A321T JFK-LAX review. Just about the only difference between Main Cabin Extra and the regular Main Cabin is legroom — but that’s a pretty major difference. Though the seatback pockets of the new slimline Main Cabin seats are able to hold less than the old seats, they’re designed to be more durable and allow you to easily see your personal items. The bulkhead row has virtually unlimited legroom, so if you’re exceptionally tall, it’s a great option. 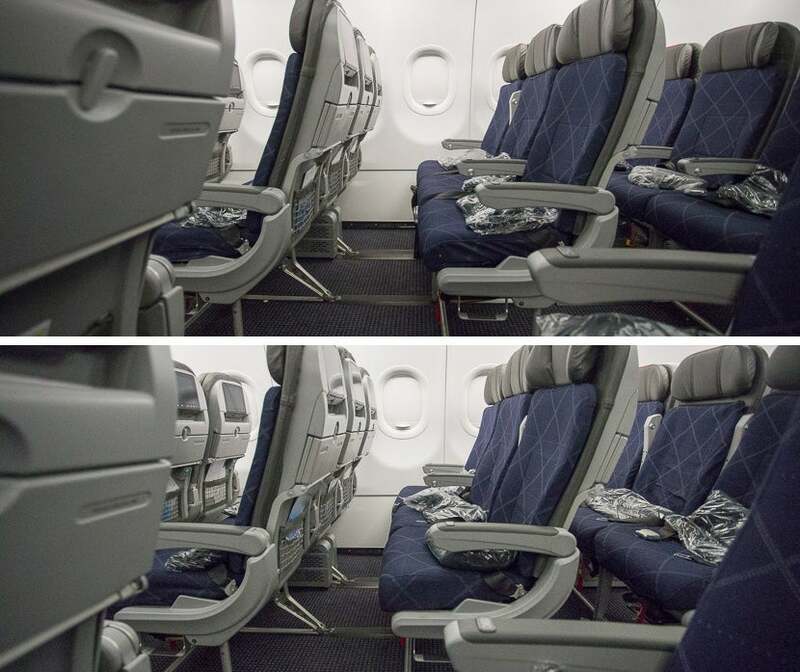 As with all bulkheads, though, you sacrifice the ability to place items underneath the seat in front of you, and your tray table will be in the armrest, slightly reducing your seat width. If you want the most legroom of any seat in the Main Cabin, choose the bulkhead seats with unlimited legroom. 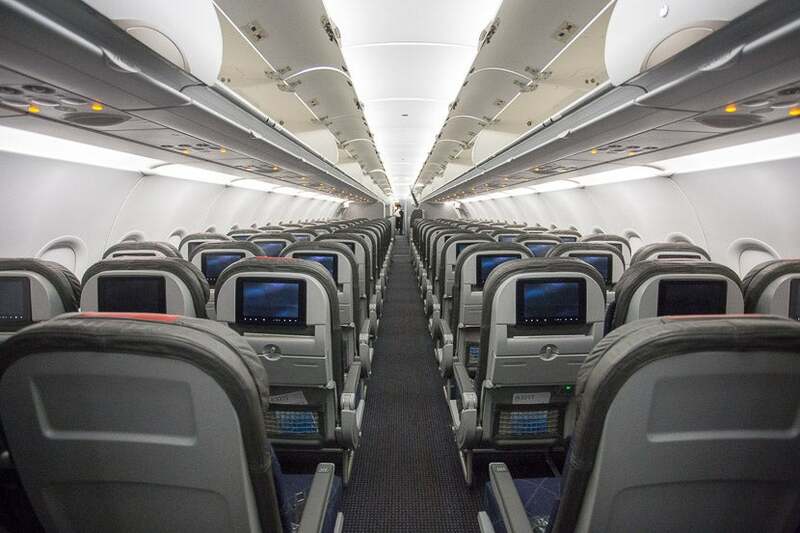 All seats in the Main Cabin and Main Cabin Extra feature power outlets, 8.9-inch seatback touch-screens and in-flight entertainment systems — though be aware that even in Main Cabin Extra, entertainment isn’t free. Underneath each seat is an entertainment/media box that takes up a considerable amount of room, so it’s unlikely that you’ll be able to use this space to store a larger carry-on. Each Main Cabin seat offers AC power, as well as for-pay personal entertainment screens. American’s new Airbus A321T is a pretty awesome plane, and the only aircraft to feature a three-cabin configuration on domestic transcontinental routes. Each cabin has a very distinct feel, but the negligible differences between first and business class might not be enough to justify the increased cost. After flying on this plane and route in all three cabins, I plan to fly only its business class in the future, which I feel delivers a good balance between cost and comfort. Plus, on light travel days, AAdvantage Executive Platinum elites have access to complimentary upgrades to business and other elites can use 500-mile upgrades just as they would on any other domestic route.